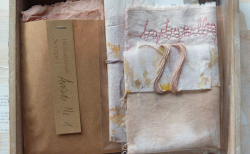 loving the textural palette and all those wonderful hand stitches.. the tassels are perfect. I love the wall behind the quilts...looks like matte ceramic. Wonderful moons. I love how you hang your works. I love these -- the layers are wonderful!